부안 동문안 당산은 돌기둥(당산)과 돌장승 한 쌍(할아버지 당산, 할머니 당산)으로 이루어진 당산이다. 마을 밖으로부터 부정한 것의 침입을 막고 마을의 평안을 기원하는 의미로 세운 돌기둥을 중심으로 동쪽 50여m 지점에 당산나무가 있고, 그 사잇길 양쪽에 한 쌍의 돌장승이 마주보고 서있다. 돌기둥은 화강암을 깎아만든 것으로 그 꼭대기에 돌로 조각한 오리가 올려져 있다. 돌기둥 주변은 당산제에서 쓰인 동아줄로 칭칭 감아놓기 때문에 평상시에는 정상부분의 오리와 그 밑의 기둥이 약간만 보일 뿐이다. 당산나무 서쪽에는 몸체에 ‘상원주장군’이라고 새겨진 남장승이 머리에 벙거지모양의 모자를 쓰고 서 있고, 동쪽으로는 ‘하원당장군’이라고 새겨진 여장승이 서 있다. 여장승은 남장승보다 키가 크지만 모자는 쓰고 있지 않은 모습이다. 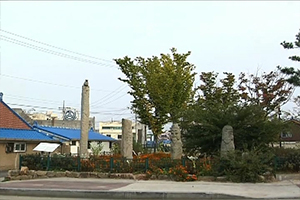 마을에서는 2년마다 음력 정월보름에 당산제를 지낸다. 새끼를 꼬아 만든 동아줄로 줄다리기를 한 다음 그 줄을 돌기둥에 감아 놓은 후 제를 올린다. 동아줄을 돌기둥에 감는 것을 ‘옷입힌다’고 하는데, 마을 전체의 복을 기원하고 농사의 풍요를 바라는 염원이 담긴 의미로 신앙물을 인격화 함으로써 돌기둥을 동제의 주신으로 받들고 있음을 보여준다. 돌기둥과 돌장승 모두 옛 모습을 잘 간직하고 있어 마을신앙을 보여주는 민속자료로서 가치가 있다. Dangsan is an object believed to be divine and worshipped accordingly. The dangsan in the East Gate of Buan consists of one stone pillar and a pair of stone guardian posts (Grandfather Guardian and Grandmother Guardian). Typically, a stone pillar is placed to guard a village against evil spirits and to wish for peace of the village. About 50 meters east of the stone pillars are a village guardian tree and a pair of stone guardian posts standing face to face on each side of the path in this area. Granite was used to carve the stone pillars, with a stone duck placed at the top of the pillar. 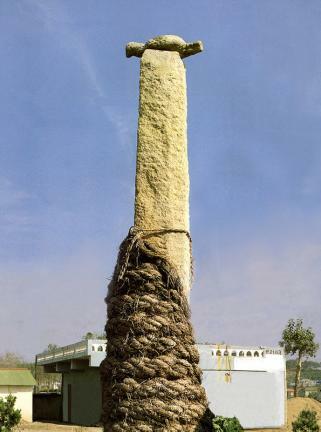 During normal times, most of the stone pillar is tightly bound with ropes used at a Dangsanje (Village Ritual); thus, only the stone duck and the top part of the pillar are visible. 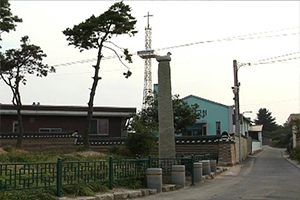 On the west side of the village guardian tree is a male guardian post standing with a hat on its head, with the name Sangwonju Janggun (General Sangwonju) inscribed on its body. On the east side stands a female guardian post with the inscription Hawondang Janggun (General Hwawondang). It is taller than the male post but has no hat. Villagers hold a Dangsanje (Village Ritual) once every two years on the first full moon of the year according to the lunar calendar. First, they play tug-of-war with straw ropes, and then hold a rite after tying the stone pillars with the ropes. This process of tying is called “dressing up.” The personification of the stone pillar suggests that it is worshipped as the main deity of the rite in praying for the welfare and good harvest of the village. 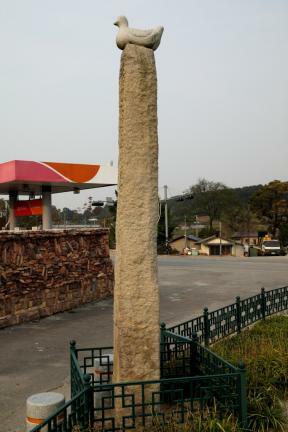 Both the stone pillar and stone posts have been well-preserved; they are valuable folk relics showing village beliefs.